I'm a little surprised the GFS jasn't done more trough splitting with the upper low near the Azores at 192hrs. One of the more interesting upper patterns at 192hrs I've seen for sure, could go either way in terms of how the LP evolves in the Atlantic. Small margin for an exceptional set-up, we will see if it comes off. I can't believe we are seeing synoptics like this at only 7-8 days out!! The GFS looks a bit messy later into day 8 but the upstream pattern is similar to the earlier run. Amplified west USA ridge and troughing eastern USA. 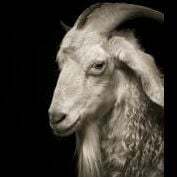 This is good news . I wonder if the low out in the atlanyic is about to link up with the low over europe dragging an even stronger/colder easterly in! That chart is full of epicness!!! S.England is right on the boundary between the real cold air and the slightly moderated air from the bubble moving into SW Europe due to the Azores Low. Could be a close run thing as to whether the whole country gets paradise or whether its limited to more northern parts from 216hrs onwards. My best guess though is the boundary will slip away southwards enough to re-introduce the coldest air back into the south. 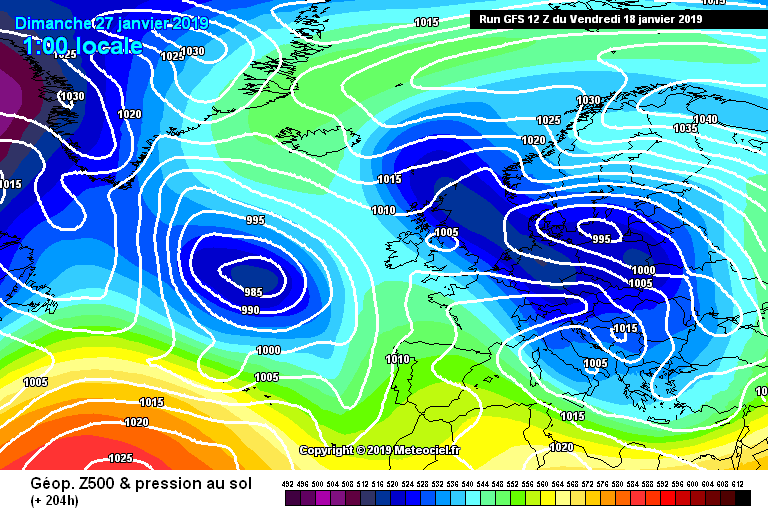 Just to show some perspective of the UKMO chart, the 850`s are cold but maybe not as cold as some may think. GFS lala land has gone full on reversal mode. Mental. anyway kold - I wouldn’t waste too much time on the minutiae of a gfs at day 9 ....another bus will be along shortly with sub day 5 stuff to look at !! 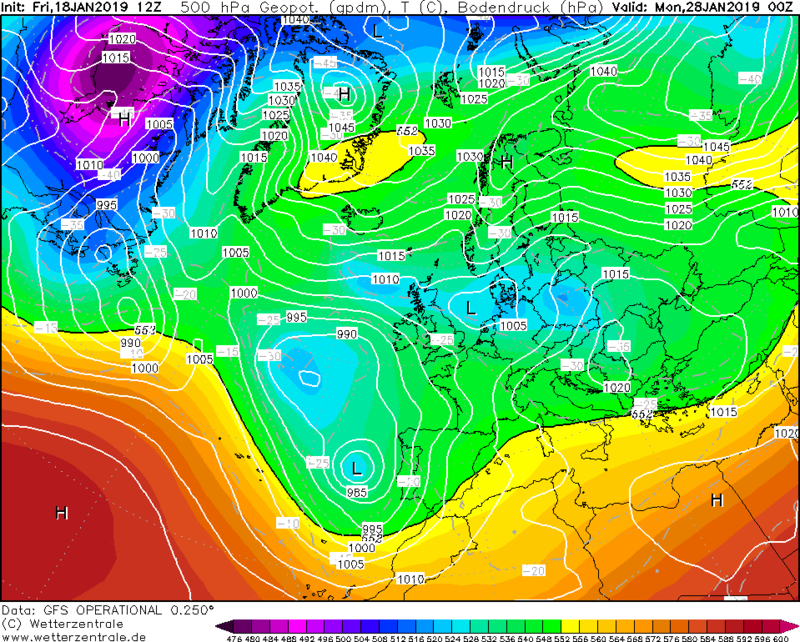 Just to show some folks the perspective of the UKMO chart, the 850`s are cold but maybe not as cold as some may think. 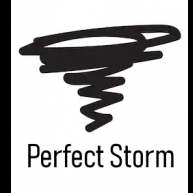 Thanks for this, though (experts correct me if I'm wrong here...) but wind will be coming in off the continent where the Dew Points should/would be lower anyways? So wouldn't need as low uppers for snow?  There will be lots of variations in terms of block placement . 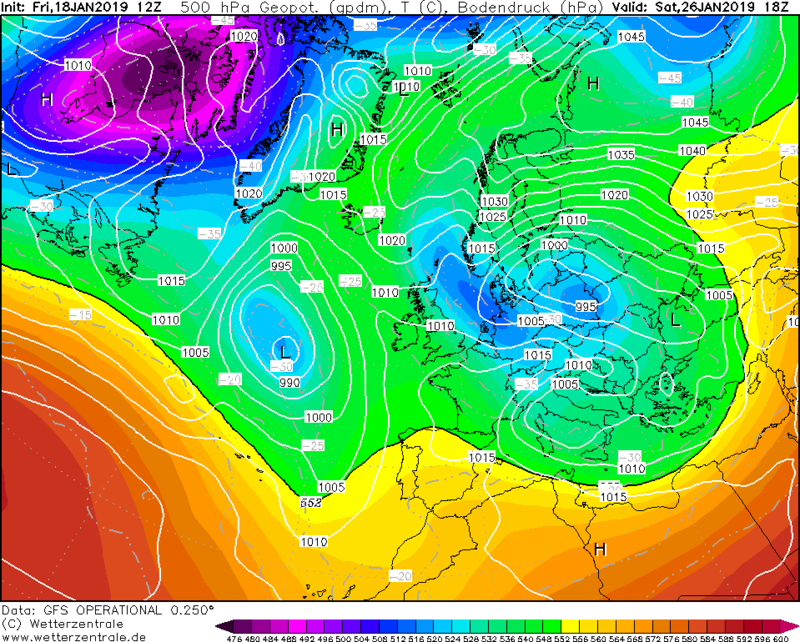 The main thing is we get to day 6 with the low to the se over northern Italy . I would go with that, dew points should be low enough regardless. GFS 12z is ridiculous. Amazing charts. 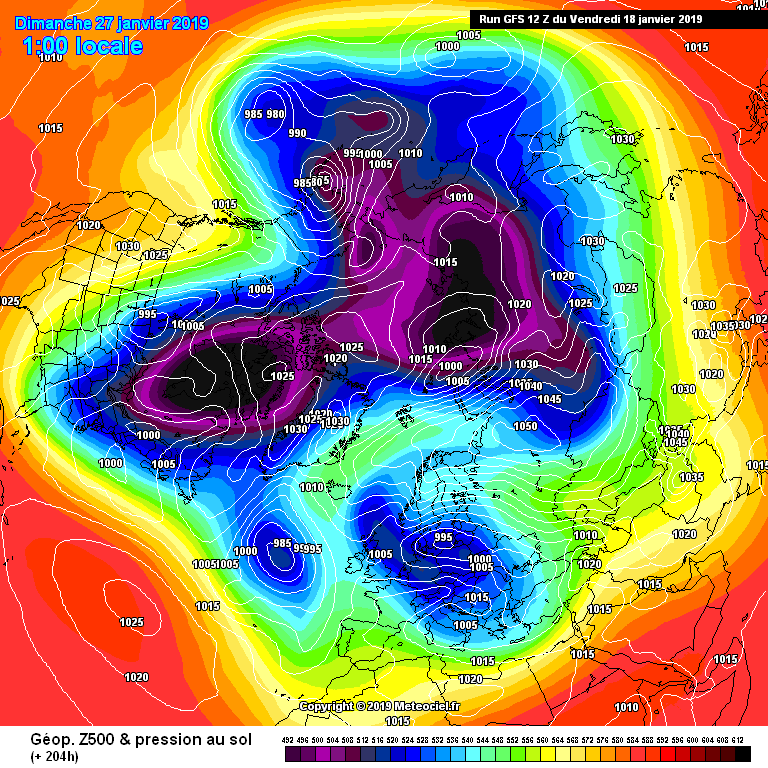 Height's all the way from Siberia via Scandi to Greenland with undercutting scenario's,WHAT MORE CAN YOU WISH FOR,absolutely stunning chart. 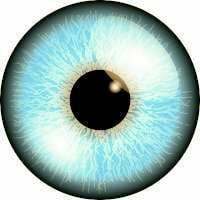 Its 6 days away pal..
And imo no worrys at all regards upper airs..we are in the zone fully..
And they will hop -and jump around on microsacale notion..
Actually looks better than I thought. Very true, but I'm quite greedy with my runs! 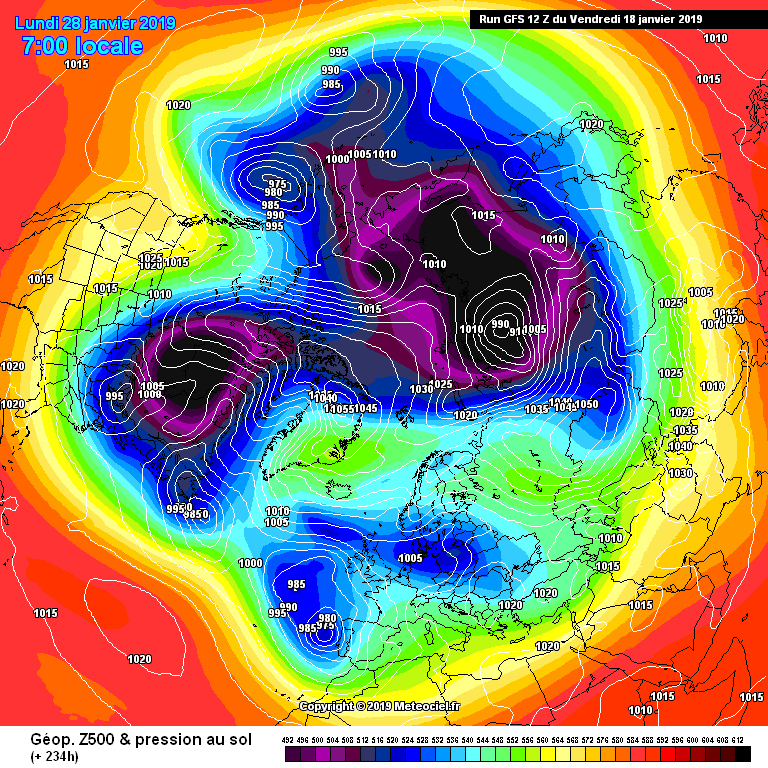 Outrageous northern blocking, its actually almost too far north for us in the south ironically! 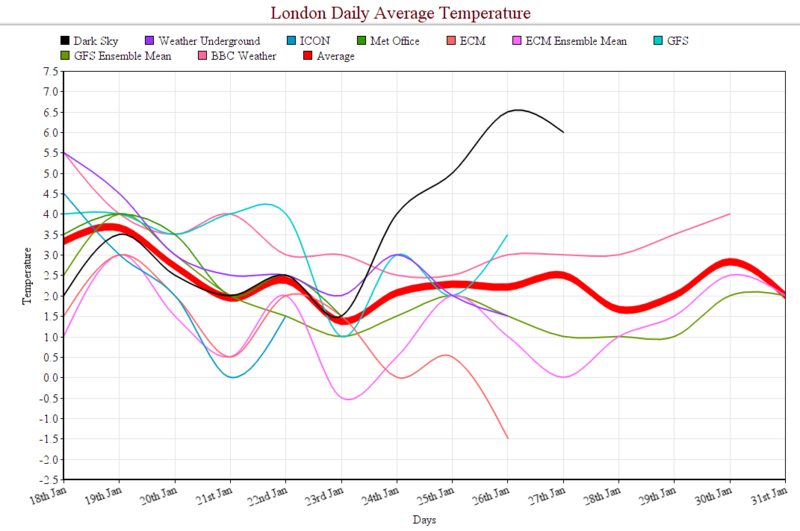 Although this is still experimental and just done it out of interest yesterday and this morning I put all the temperature data from a number of weather forecasts and weather models to look at the average daily temperatures for London. 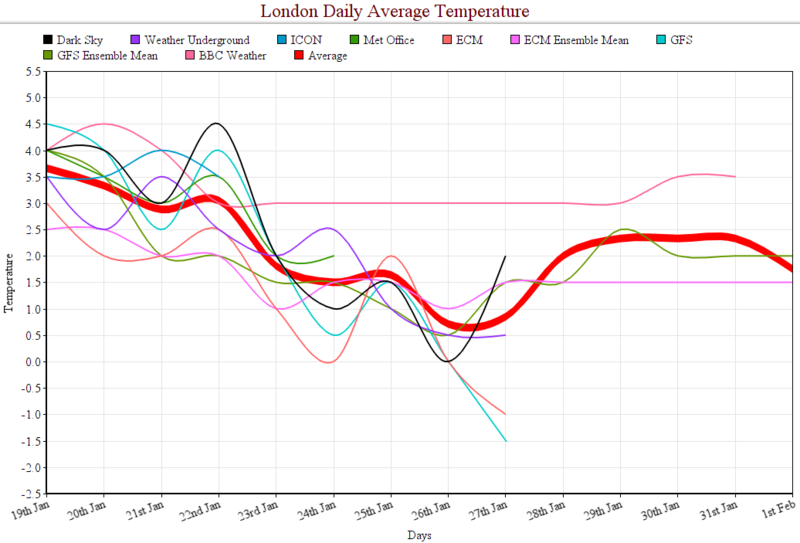 I believe it's a good way to look at the trends for the long range temperatures. As the two charts show there's good agreement overall for it to get colder next week. 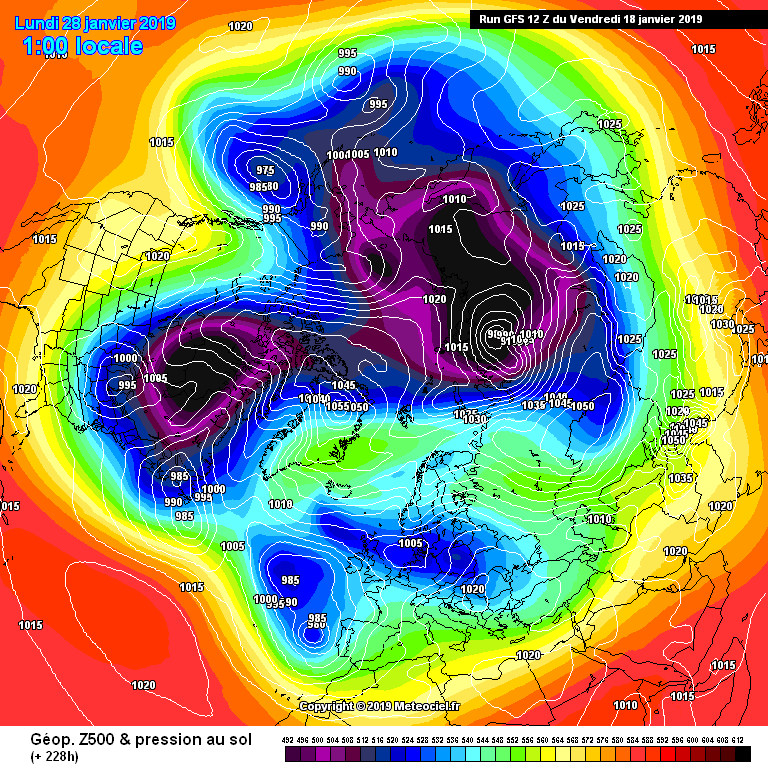 Heig ht's all the way from Siberia via Scandi to Greenland with undercutting scenario's,WHAT MORE CAN YOU WISH FOR,absolutely stunning chart. To be honest just seeing the blocking signal retained this afternoon is good enough for me, detail can come later. In terms of winter synoptic for the UK it doesn't really get much better than the 12z GFS - Atlantic ridge, Scandi high, Murr sausage, full retrograde pattern, Greenland high.